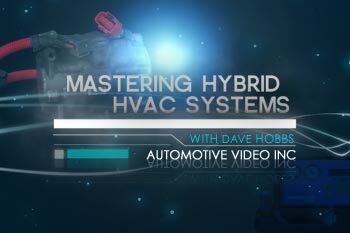 In this program, Instructor Dave Hobbs teaches you hands-on fundamentals to servicing Hybrid A/C systems. Advance your diagnostic strategies by understanding these complex systems through live on car demonstrations. Dave covers essential hybrid A/C technical tips and tricks on how to keep not only your customers cool but the hybrid battery from overheating. Hybrids are 95% the same as a traditional vehicle, however diagnosing that 5% difference can be difficult without knowing important hybrid scanner data PID information. Dave introduces you to these hybrid data pids like evaporator fin thermistor, solar sensor, engine coolant temp sensor, air mix servo pulse, electric heater current, and compressor speed using Toyota’s factory scan tool, the Tech Stream to help you understand good vs bad data readings. Dave also discusses safety tips when evacuating and recharging the A/C system, informing us about the importance of using a J2788 compliant recovery machine to stabilize critical charge systems and demonstrates how to remove harmful PAG oil from the recovery machine and it’s hoses to avoid contamination. LEARN HOW TO APPLY THE TECHNIQUES TODAY, AND REDUCE DIAGNOSTIC TIME TOMORROW.